Today the vast majority of the world’s saloon cars are driven by their front wheels, with engines that are transversely located across the car to provide the maximum amount of space for the occupants. Things haven't always been this way, in fact for the first 80 or so years of the passenger car's history, most were pushed along by their rear wheels driven from front-mounted, in-line engines. The vehicle that brought about the design revolution is Alec Issigonis’s Mini, introduced by the British Motor Corporation in 1959. Issigonis began on the design, coded ADO15, in 1957. His aim was to produce a small car to compete with the swarms of bubble cars that were invading Britain. The petrol rationing that followed the 1956 Suez Crisis attracted many of these German imports. 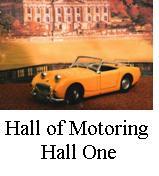 1960 saw Mini van & Estate cars introduced and a Vanden Plas model was added. In 1961 the Mini Pickup was introduced. Next came Mini-Coopers in 997cc form , giving 55 bhp, good for 90 mph. Later with 1071cc, increasing to 1275cc these cars could pass 100 mph . 0 - 60 was achieved in 11 seconds. Such performance was sure to give competition success. Mini's won the Monte Carlo Rallye in 1964,1965 and 1967. Mini Coopers also finished 1,2,3 in the 1966 event but were disqualified on the grounds that their variable dimming headlamps (instead of standard dual filament lamps) were illegal. The French organisers gave first place to a Citroen DS, despite the fact that it's headlamps were white and therefore also illegal. This controversial decision still causes debate today! The red car above is Pat Moss’s 1962 Monte Carlo Mini. Pat Moss and Ann Wisdom finished 26th overall, 7th in class and won the Coupe des Dames. The pair had also given the Mini it's first international Rally win when they took their Mini to first place in the 1962 Tulip rally. Other rally wins for the Mini came in the RAC British rallies of 1962, 1963 and 1970. Timo Makinen and co-driver Pekka Keskitalo took a Mini Cooper to victory in Finlands 1000 lakes rally for three consecutive years from 1965 to 1967. But Mini coopers won on the track too, in venues as varied and historic as Australia's Bathurst, when Rauno Aaltonen and Bob Holden won in 1966; Snetterton sprint race in 1963 and dominated racing in Britain through 1964-65 winning the British saloon car championships 1300cc class in 1967 before going onto take the European tourig car challenge in 1968 and the BSCC overall title in 1969! But if all this wasn't enough to secure the Mini a place in history becoming a film star was sure to do the trick. In 1969 "The Italian job" had big names like Matt Munro and Michael Caine Noel Coward and Douglas Slocombe on its credits but what most people think of when the film title comes up are the cars. Red, white and blue Mini Coopers. From 1961 to 1969 two "cousins" to the Mini were made available. Designed to be more luxurious versions and featuring an extended boot with small fins above the rear wings these cars looked more like the traditional saloon cars of the day. The Riley Elf and the Woleseley Hornet drew on the history and design elements of these earleir marques and gave the new models a more upmarket appeal. Both were made to be less utalitarian featuring wood veneer dashboards and additional chrome accents all around the car. Both these versions also went through design upgrades and also had success on track, fitting for cars who took their names from sports cars of the past. The museums Mini collection starts with a model that is almost as old as the Mini itself. Airfix released there 1/32nd scale kit in the early 1960s and Rod built it then. but he choose to model it as Pat Moss' car using dry transfere markings rather than a straight road version. He also made the front wheels steerable. It is all brush painted with Humbrol enamels. Ian built Tamiyas kit in 1991 so this is also brush painted in Humbrol enamels. It was built straight from the box as a standards Morris Mini. Interesting that there has been a reversal in the normal building curves. Tamiya have released many versions of the Mini, in road, track and rally versions. They are all based on the same kit so are all very nice indeed. Being a great base kit for conversions to the pickup and clubman forms it was only a matter of time before someone took on the challenge of making an Elf or Hornet. Scale Kraft, of South Africa, made some great transkits and curbside kits in resin. They are now out of business but some of the kits pop up from time to time and some of the range has reportedly been taken over by other producers, but the kits remain hard to get. Rod built his Riley Elf around 2000 and as such it benifits from Halfords car paints and bare metal foil. The interior is painted with Humbrol and Citadel acrylics utilising washes and drybrushing to give the seats more life.